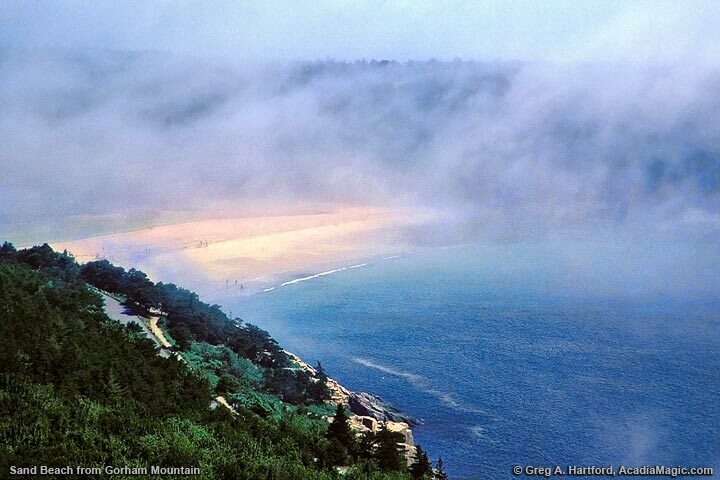 Gorham Mountain Trail is one of the most popular hiking trails in Acadia National Park. 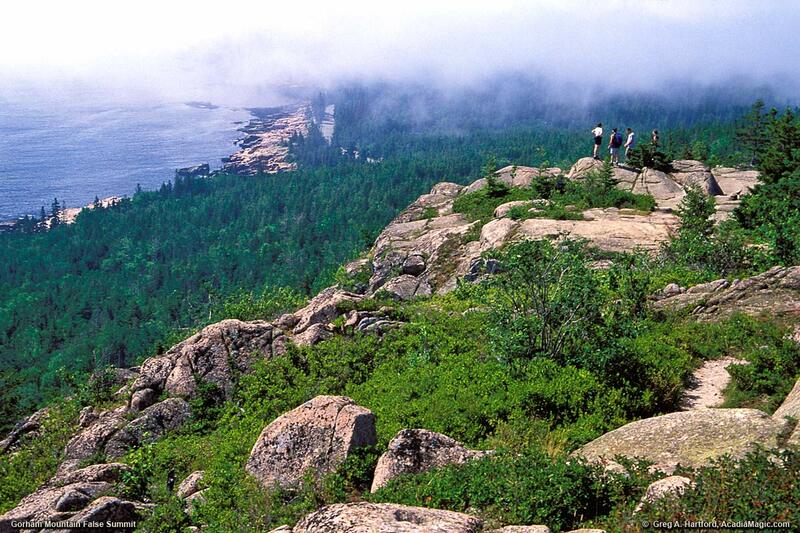 With a 525 foot summit, Gorham Mountain is not one of the higher mountains on Mount Desert Island, but its close coastal location provides views that are both intimate and spectacular. Your ascent begins from the Gorham Mountain Trail parking area located on the Park Loop Road, a short distance on the right side a short distance past Thunder Hole. Rated as moderate, the hiking trail begins as an easy steady climb through a spruce forest, gradually becoming more rugged as it opens to a granite ascent. Not long after your start, you will come upon a picturesque setting where the trail splits. You will notice a plaque honoring Waldron Bates - Pathmaker. He was the first to utilize stone stairways and iron rung ladders in the trails to help hikers traverse cliffs, talus slopes (the sloped mass of rocks at the base of a cliff), and other steep areas. The Gorham Mountain Cadillac Cliffs Trail, which breaks to the right, is a good example of his work. However, I suggest that you take the left option for your climb. The right trail can be very rough in places and there are some outcroppings where rocks jut out over one's head. Use your own judgment on this. 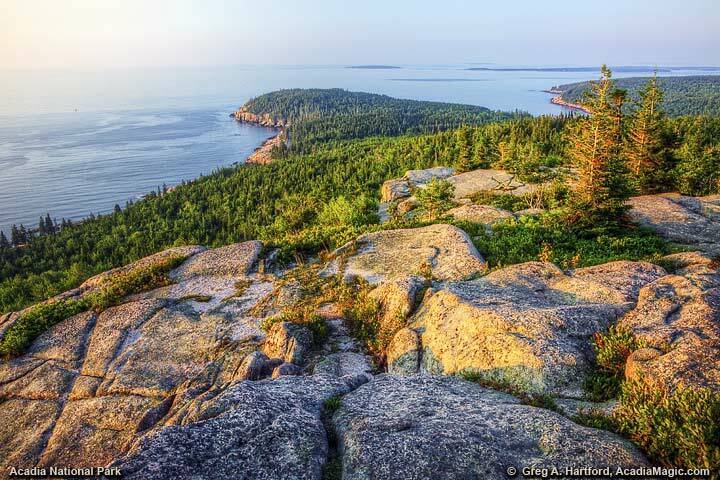 Soon, you will reach what is known as the mountain's false summit where you will have an open view of Otter Cliff, Otter Point, Baker Island, and the Cranberry Islands. This false summit area was scorched by the famous 1947 fire that devastated a large part of Mount Desert Island and you may see some of its remnants. Further up ahead is the true summit, your goal for this hike. The blue trail markers and cairns are visible and well placed to guide your direction. The Park Service does a good job of inventorying them. I was recently on this trail early on a Sunday morning and they were checking their locations and accuracy. Once you have arrived at the true summit of Gorham Mountain, you will want to relax, breathe in the ocean breeze, and devour the panoramic visual buffet that Acadia National Park provides. To your north is the Beehive. To your northeast - Sand Beach. To your east - Thunder Hole. And, to your southeast is Otter Cliff. Round trip from here is approximately 1.8 miles (2.9 km) but you may choose to continue on to The Beehive. When hiking during the end of July and most of August, don't forget to pause and sample some of the Wild Maine Blueberries that grow each year along these mountainous trails. Enjoy! 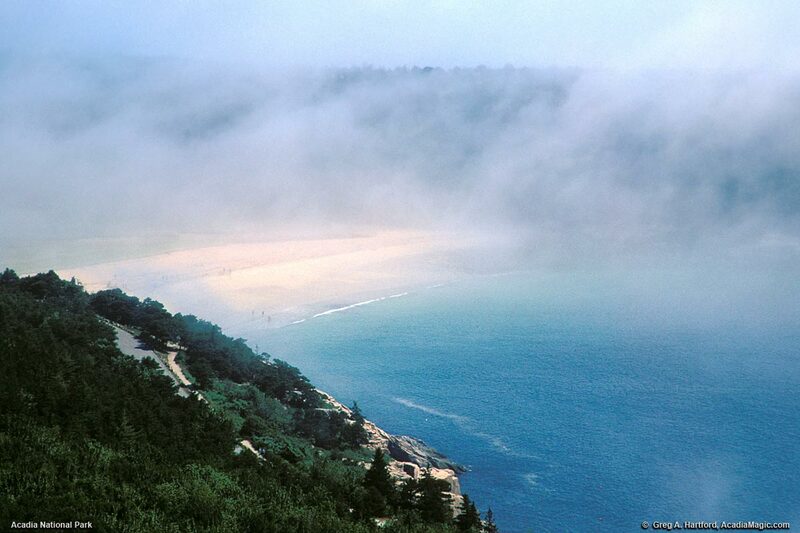 Refer to the Acadia Hiking Trails page for suggestions and rules while hiking in Acadia National Park. Enjoy your visit. This is a most special place! Personally, I really like the Gorham Mountain Trail. According to the hiking trail rating system, it is a moderate trail only 1.8 miles (2.9 km) round-trip. This is an important consideration when lugging some heavy photo gear up to a 525 foot summit. More importantly, other than Cadillac Mountain, there is no better spot to capture so many prime places on the eastern side of Mount Desert Island from. It is very important to be sure that you have the right type of hiking shoes or boots for the climb as you will definitely need solid ankle support. Once on top of the mountain, you also will have the choice of continuing north toward the Beehive which is just to the northwest of Sand Beach. Note: Families need to supervise children closely and not do this climb unless experienced.